The Engagement ceremony is the mutual announcement of the marriage between the groom and the bride and both their family members are in agreement with each other. On this special occasion day, all the family members and relatives of the people going to marry gather and make the announcement about the marriage and its date. 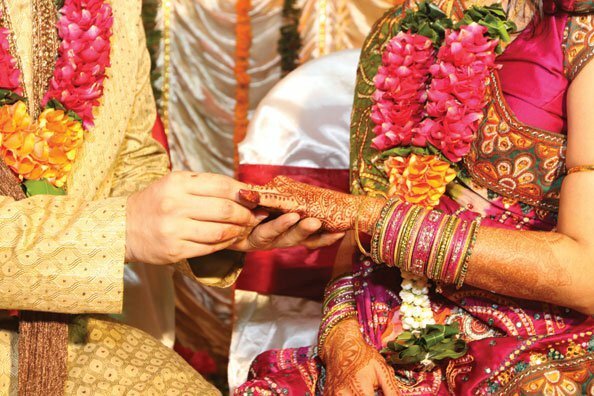 A written Letter is known pathiram about the marriage that is going to happen and the signatures from the members of both the families are received and the signed letters are then documented for legal purposes. The ceremony starts with Ganapathi Pooja and then Punyahavachanam is done followed by distributing the new set of clothes to the bride and the groom to get ready for the engagement and then the agreement letter is read to the peoples gather by our priest in front of all the family members. Once the engagement is done the couple gets blessings from all the elders in the family for a successful and a long marriage. This ceremony is performed on an auspicious day for the bride and the groom and their parents as per their nakshatras and chandrashtamam is also seen for fixing the time for the engagement. It is done both in the morning and also in the evening.